Bento lunch boxes have been popular amongst the meal-prepping community for years, but have recently gained popularity among others as well. As a result, the market has been absolutely flooded with bento lunch boxes of all shapes and sizes, each one with more elaborate features than the next. If you are a new bento lunch box user, picking out the best box can be an overwhelming task. Luckily, we have read the reviews and done the research for you. Below are some of the highest rated, most unique bento lunch boxes on the market, so you are guaranteed to find the best one for you and your family. This lunch box is comprised of a 20oz base with 10oz layers, separated by 3oz layers to store sauces and other liquid components. Each layer is composed of a stainless steel tank and a foam insulation layer, which guarantees that your food will stay warm or cold for up to three hours. The ArderLive Stackable Bento Box also has multiple size options, so you can choose a two, three, or four-layer box based on your needs. The finishing touch is a carrying case that has both foil and felt insulation layers and a convenient handle to carry it. 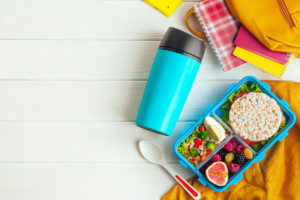 Because this lunch box has a vertical orientation, it is easy to store in a backpack where a horizontal lunch box would take up too much space. The Tabkoe Bento Lunch Box has several unique features that stand out from other similar boxes. It can accommodate two full-size meals and comes with its own full set of cutlery. This bento lunch box also uses a silicone seal to ensure that each layer is completely leakproof. It also is incredibly safe since the entire box is dishwasher, freezer, and microwave compatible in addition to being BPA free. The icing on the cake is that the creators of this box put just as much thought into the appearance of the box as they put into the design of the individual components. It features a beautiful exterior, complete with a “bamboo finish” on the lid and a stylish black band to hold it all together. 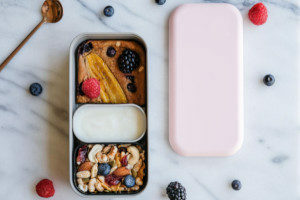 As bento lunch boxes have become more mainstream, they have also strayed from the format of a traditional Japanese bento box. This box brings back traditional bento box elements such as a rice ball press and a decorative bag to carry the box in. This box has two layers, and the upper layer collapses into the base when your meal is finished to save space. This kid friendly lunch box is sure to please the littlest members of your family. Not only is this box designed to accommodate toddler and elementary-age portions, it also comes with a fork, spoon and fruit pick. The outside of the box is animal-shaped and comes in a variety of colors to accommodate your child’s preferences. Planning healthy, kid-friendly lunches is usually time consuming at best and frustrating at worst, so the creators of this box have included a free ebook with bento box recipes with the purchase of this box to remove one more step from your morning routine. Kangovou takes bento lunch boxes to an entirely new level. Their products come in a variety of sizes and shapes, including large and small bento lunch boxes, compartment plates, snack bowls, and cereal bowls. They also feature a wide variety of colors with tightly sealed lids and easily insertable dividers. Every Kangovou product is guaranteed to be free of BPA, lead, PVC, and melamine, so you can eat your lunch knowing you are using the highest quality, environmentally friendly containers. Kangovou’s compartment plates are designed to be thin enough to slide into your backpack or briefcase, and you can confidently rotate them to find the best fit knowing that the four hinged, lock-tight lid will prevent any spills. Another benefit of the lock-tight lid is that your food remains at your preferred temperature from the moment you pack it until you eat it, making microwave trips a thing of the past. Hopefully this helped you narrow down your bento lunch box options and gave you a good idea of how to start your search. To find the best bento lunch box for your needs, explore our wide variety by shopping online at Kangovou.com.